'Wake up, genius.' So begins King's instantly riveting story about a vengeful reader. The genius is John Rothstein, a Salinger-like icon who created a famous character, Jimmy Gold, but who hasn't published a book for decades. Morris Bellamy is livid, not just because Rothstein has stopped providing books, but because the nonconformist Jimmy Gold has sold out for a career in advertising. Morris kills Rothstein and empties his safe of cash, yes, but the real treasure is a trove of notebooks containing at least one more Gold novel. Morris hides the money and the notebooks, and then he is locked away for another crime. Decades later, a boy named Pete Saubers finds the treasure, and now it is Pete and his family that Bill Hodges, Holly Gibney, and Jerome Robinson must rescue from the ever-more deranged and vengeful Morris when he's released from prison after thirty-five years. Not since Misery has King played with the notion of a reader whose obsession with a writer gets dangerous. 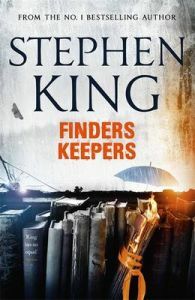 Finders Keepers is spectacular, heart-pounding suspense, but it is also King writing about how literature shapes a life - for good, for bad, forever. Stephen King is the bestselling author of more than fifty books. His novels include Carrie, The Shining and Revival. His novel Under the Dome is now a major TV series. His novel 11.22.63 won the Los Angeles Times Book Prize for Mystery/Thriller as well as the Best Hardcover Book Award from the International Thriller Writers Association. Many of his books have been turned into celebrated films including Misery, The Shawshank Redemption and The Green Mile. Over the years, King has had various cameo roles in film adaptations of his books as well as playing rhythm guitar in the Rock Bottom Remainders, a rock and roll band made up of some of America's bestselling and best-loved writers He was the recipient of the 2003 National Book Foundation Medal for Distinguished Contribution to American Letters. He lives with his wife, novelist Tabitha King, in Maine, USA.